lines. Adjust each side of the dress sleeve foundation to correspond with the adjustment of the bodies armhole and side seams. 2) draft raglan armhole seam lines, slightly curved. For side dart draw slash line: then slash and spread as described for the jumper dress”. Draw curved/lines on each side of sleeve caps shown by dotted lines. 3) Slash each side of sleeve and spread 1-1/2” at underarm. [Spread at underarm must always equal twice the amount the armhole was lowered]: then connect at each side to elbow line. Trace raglan section F and G: then apply them to top of sleeve cap C and D. 1” apart. 1/2” to center front for front closing overlap. Draft front facing 4” wide as shown by dotted lines. Add seams and make corresponding notches. and sweep at lower edge to be worn over a stiffened crinoline petticoat. 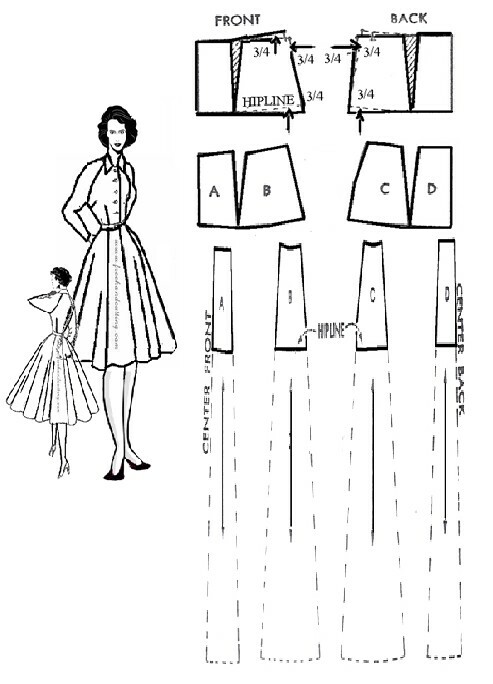 5)Trace hip section of the dress foundation: then curve hip and waist line up ¾ toward the side, and reduce waist line of inch at each side seams as shown by dotted lines 6) Divide hip section into 4 parts by cutting along dart lines. Mark section A to D.
8) For addition sweep ,Add about 2-1/2 at bottom of each seam. To nothing 3” below waistline.